by Polunov, Alexander, Zakharova, Larissa, Owen, Thomas C.
Polunov, Alexander, Zakharova, Larissa, Owen, Thomas C.
This is a comprehensive interpretive history of Russia from the defeat of Napoleon to the eve of World War I. It is the first such work by a post-Soviet Russian scholar to appear in English. 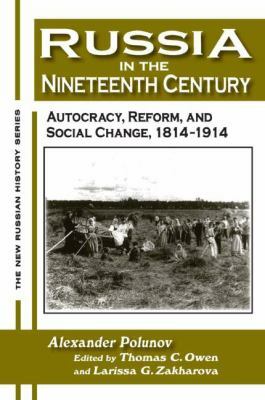 Drawing on the latest Russian and Western historical scholarship, Alexander Polunov examines the decay of the two central institutions of tsarist Russia: serfdom and autocracy. Polunov explains how the major social groups-the gentry, merchants, petty townspeople, peasants, and ethnic minorities-reacted to the Great Reforms, and why, despite the emergence of a civil society and capitalist institutions, a reformist, evolutionary path did not become an alternative to the Revolution of 1917.Polunov, Alexander is the author of 'Russia in the Nineteenth Century Autocracy, Reform, And Social Change, 1814-1914', published 2005 under ISBN 9780765606723 and ISBN 0765606720. Loading marketplace prices 79 copies from $31.97 How does the rental process work?